In his previous exhibitions, Michael Villagante explored the depths of the suffering body, externalizing physical, emotional, psychological, and spiritual upheaval through a slew of symbolic imagery of fauna and flora, populating a world dense and lyrical with silent transformations. As a direct address to his predicament, the works functioned as testimonies to the alchemic power of art, to its capacity for healing, to its bodying forth of the invisible struggles of the flesh. For Higher Ground, one detects a departure from this narrative towards an evocation of a body—and soul—at peace, having found access into a transcendental mode of expressiveness, a reachable Eden. The figures in his works, either in unison such as in the title piece “Higher Ground (See My Heart)” or alone in the rest, exhibit a certain weightlessness, as though what had been dragging them all along were suddenly released. In that rarefied realm where their feet meet clouds and their heads commune with a dreamy mass of animals, they enter a zone of pure and absolutely detachment, shrugging off worldly cares and concerns. Mingling and intermingling with the furiously lush flora and fauna are recognizable references to the works of artists notable in Villagante’s instruction and growth: from Vincent van Gogh to Rene Magritte to Salvador Dali to Edvard Munch to Hieronymus Bosch. Some readily visible and others thoughtfully concealed, they pepper his works like visual treats, as if to underscore how art weaves indelibly into the spirit, something that we carry in us as it structures how we see the world. Its incarnations in the works are diverse: from van Gogh’s “Starry Night” to Jeff Koons’ balloon dog to John Pasche’s iconic tongue and lip design for The Rolling Stones. 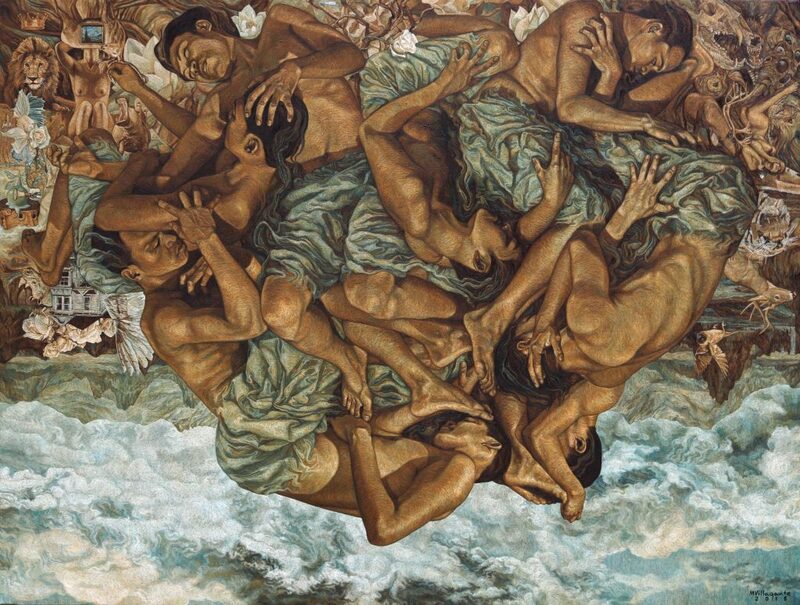 Indeed, one can’t help but think that the works in Higher Ground represent flashes of the artist’s utopic vision, his conception of harmony and the marriage of the internal and the external, the body and the soul, the natural and the man-made. The breaking of hierarchies is further emphasized by the orientation of the figure the against ground: the works may be seen upside-down and they will not lose their vigor. These paintings manifest a particular juncture in Villagante’s self-discovery, not free from mortal aches and pains exactly, but teeming with a luxurious contentment, a fecund strength, a durable peace.